Hearthstone is great, in part, because it's so damn fast. If you don't make a move in 90 seconds, tough luck. One player, however, has figured out how to make a single turn last more than 40 hours. 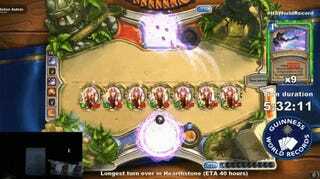 As Eurogamer discovered, a player named Mamytwink is trying to break—or shred into a breathable mist of virtual cardboard flakes, as it were—the world record for longest Hearthstone turn ever. His plan involves setting off a chain reaction of attacks that will take more than 40 hours to complete. The short version? Mamytwink has seven Prophet Velens in play, each of which double the number of arcane missiles he, as a mage, fires. He's buffed each Velen with numerous other cards to boost damage even further. To set things in motion, he played nine arcane missile cards in this one turn, which—thanks to all the Prophet Velens and their buffs—comes out to 28,752 missiles (258,768 points of damage). If Mamytwink's math is correct, it should take somewhere in the ballpark of 43 hours for the animation of all those missiles firing to complete. Now, you might be wondering why his opponent isn't a charred pile of stardust—a few thousand times over—at this point. It's because they're using Ice Block, which staves off even the most certain of dooms for one turn. Sitting through said eternal turn, though? Sorry, that's beyond the limits of Ice Block's powers. So far, the turn's been going for over six hours, which is already ridiculous by most metrics. And yet, it's only getting started. If you're wondering where Mamytwink is, well, he's out or sleeping or something. I can't blame him. You'd have to be nuts to sit there and watch sparkly wooshy beams ineffectually ping off an absentee opponent for 43 hours. Anyway, I'm gonna get back to watching this stream of sparkly wooshy beams ineffectually pinging off an absentee opponent for 43 hours.